We love a good clock build around here, especially if it tells time in a unique way. This 4-stroke digital clock designed by [lagsilva] takes the checkered flag in that category. As it displays the time, it also demonstrates the operation of an internal combustion engine. The numbers take the form of pistons and dance an endless repetition of intake, compression, combustion, exhaust. The clock’s digits are made from two LED matrices driven by an Arduino Uno and a couple of MAX7219 driver boards. The dots that form the digits move up and down the matrices in 1-3-4-2 firing order. As each piston-digit reaches top dead center, its number lights up. This makes it easy to see the firing order, even at higher RPM values. Our favorite thing about this clock is the variable RPM setting. There’s a 10k pot around back that adjusts the speed of the pistons between 100 and 800 RPM, and it’s configured to accurately represent piston movement at each increment. Floor it past the break to watch the clock rev up and slow back down. Although it’s difficult to read the time at 800 RPM, it’s awesome to see a real-time visualization of cylinder movement at the average idle speed of a passenger car. We think it might be neat to rev the engine another way, like with an arcade throttle lever or a foot pedal. If you like the idea of a constantly-moving clock but prefer an analog readout, take a minute to look at this clock without a face. Are you a student? Are you part of a hackerspace? We have a contest going on right now where you can win a fancy new Prusa i3 MK3. The Repairs You Can Print contest is a challenge to do something useful with that machine that spits out tugboats. We’re looking for functional repairs of items around your house, office, or garage. Did you repair something with a 3D printer? Then you too can get in on the action! Enter now! Check out the entries! You may know Flite Test as the group who do everything surrounding remote control flight (mostly fixed wings, a nice counter to the quadification of the hobby over the last few years). Flite Test designs and sells airplanes made out of Dollar Tree foam board, they have yearly, bi-coastal meetups, and they’re all-around awesome dudes. Now, they want to build the Disneyland of RC flight. [Josh Bixler], the face of Flite Test and a guy who has a plane named after him, wants to buy a golf course and turn it into the world’s best RC flying park, with a ~2000 foot grass strip for general aviation. We’re looking at their crowdfunding campaign, and it looks promising it might be funded by the time this goes live. Oh thank God we can finally buy GPUs again. Try buying them with Bitcoin. In the last few years, CITES, the Convention on International Trade in Endangered Species of Wild Fauna and Flora, has expanded. Originally, this was one of the treaties that banned the import or export of rhino horn, but recently this expanded to the export of rosewood thanks to increased demand in China for rosewood furniture. The laws of unintended consequences kicked into effect, and importing anything made out of rosewood is now a mess of permits and inspections at the border, including musical instruments. Travelling orchestras, for example, are at risk of having their string section confiscated because of rosewood tuning pegs. Cooler minds may now be prevailing, and there’s some hope the regulations may be changed during the next meeting of the CITES convention next year. As noted a few months ago, there was a possibility of Broadcom buying Qualcomm for one… hundred… Billion dollars. This offer was rejected, with Qualcomm saying the offer wasn’t high enough. Broadcom fired back with an offer of $82 per share, or $121B. This offer was rejected this week. Need some EMC testing? [Zach]’s got your back. He’s reserved some time in a 10m EMC chamber for testing NeuroBytes this week. If you have an Open Source project that needs a pre-test scan for unintentional radiator, you can get in on the action. This is just a pre-test, you’re not getting certification, and you’re not going to test anything with radios, and you need to ship [Zach] your stuff. But still, free test time. Woo. 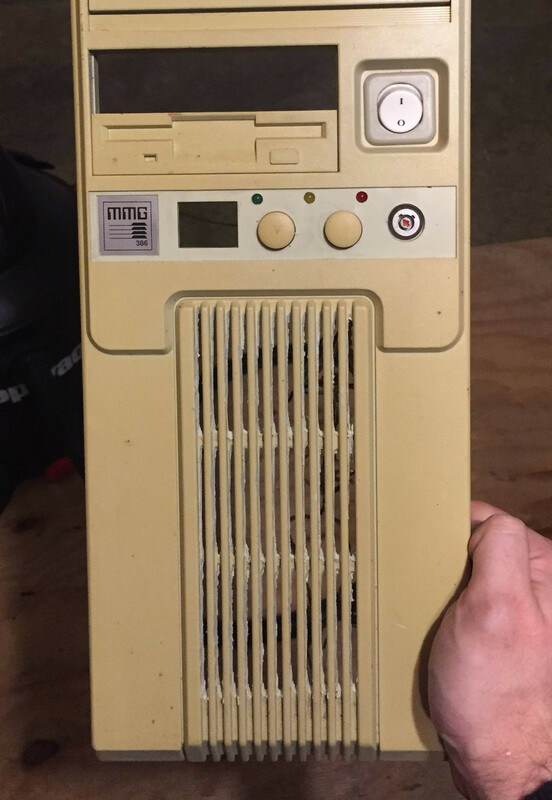 Until a flood claimed its life, the 386 tower [Tylinol] found on the side of the road served him well as a DOS gaming rig. In the aftermath of the flood, the machine was left with ruined internals and a rusted case; it ended up being tossed in storage where it was slowly rotting away. But a recent idea got him to drag this old dinosaur back out into the light of day and give it a new lease on life with some modern gear. For our viewing pleasure [Tylinol] documented the restoration of the computer, dubbed SErEndIPITy, from start to finish. The rebuild starts with tearing the machine down to the steel frame and sanding all the rust off. Luckily it looks like no structural damage was done, and a coat of engine enamel got the frame looking more or less like new. The original motherboard mounting solution wouldn’t work for his modern board, so he ended up riveting a piece of sheet metal in and drilling new holes for standoffs to thread into. A nice element of this rebuild is that [Tylinol] didn’t want to drastically change the outward appearance of the machine. The customary yellowed plastic was left alone, and wherever possible the original hardware was reused. Rather than blow a hole in the case, he took his Dremel to the decorative ribbed design of the front panel and turned it into a stock-looking vent. The real star of this rebuild is the LED CPU “Speed” display on the front of the case. In its original form, this was a fake display that simply cycled through predefined digits when you pressed the “Turbo” button on the front panel. By grounding them one at a time, [Tylinol] figured out which lines on the PCB controlled each segment of the display and wired it up to a Teensy 3.5. He was then able to write a C# plugin for CoreTemp to display the temperature. Cramming modern hardware into the carcass of an outdated computer is nothing new, of course. But we especially like the builds that take the time to make it all look stock.